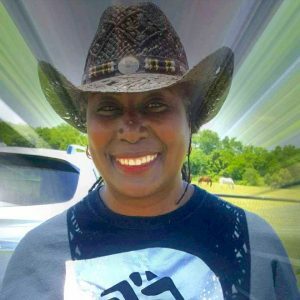 Carolyn Barnett is one of our most faithful volunteers, usually taking care of our horses 6 days a week, and sometimes more. Carolyn is a veteran of the U.S. Coast Guard and a retired Correctional Officer for the state of New York. Carolyn always dreamed of being a cowgirl, working with horses, and being in the open air. While preparing to move from New York to Texas, Carolyn did some research and discovered Gabby’s Sanctuary ARK. She sent an inquiry, and of course, we welcomed her into the GSA family. 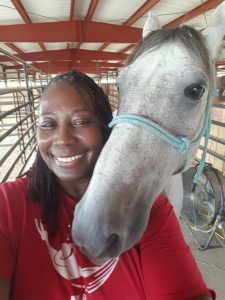 Carolyn enjoys learning about horses from the ground up at Gabby’s ARK, rescuing animals, and giving back to the community. She also enjoys getting everyone’s day started right when she arrives in the mornings. She handles the feeding, checks to see that all of the horses are well and don’t have any wounds or issues that need to be medicated or seen by the vet, and sings a special song to each horse. She also sponsors Oscar and the photo below shows that they are best buddies.